Hello 👋🏾👋🏾👋🏾!! IT’S OCTOBER and you know what that means…..HALLOWEEN 🎃🕸🕷🎃!!! 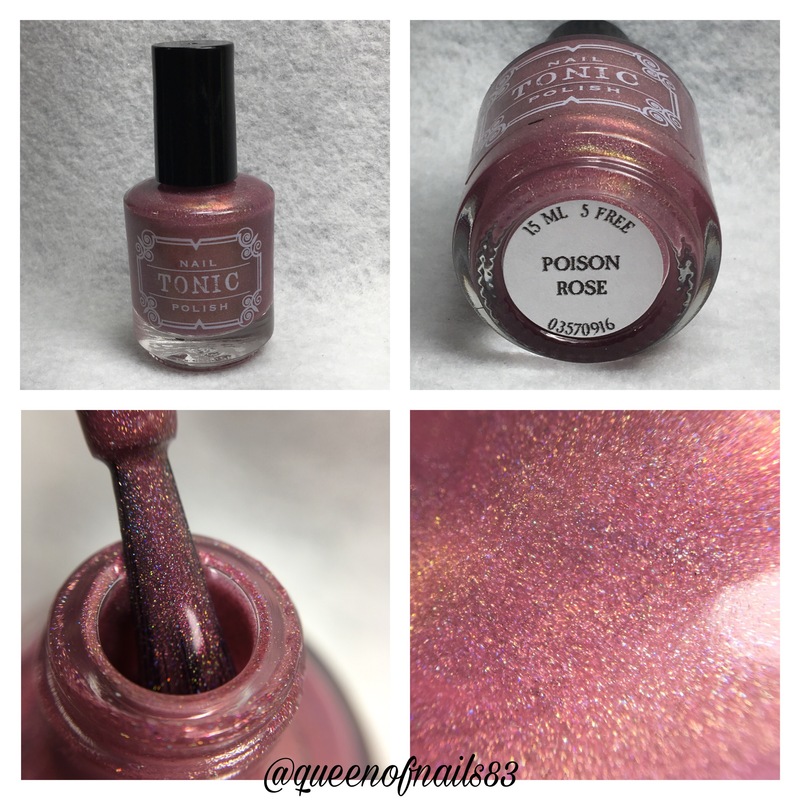 Even better it means Halloween collections and I am so excited to have the Halloween Collection and a couple more surprises from one of my favorite brands…Tonic Nail Polish! 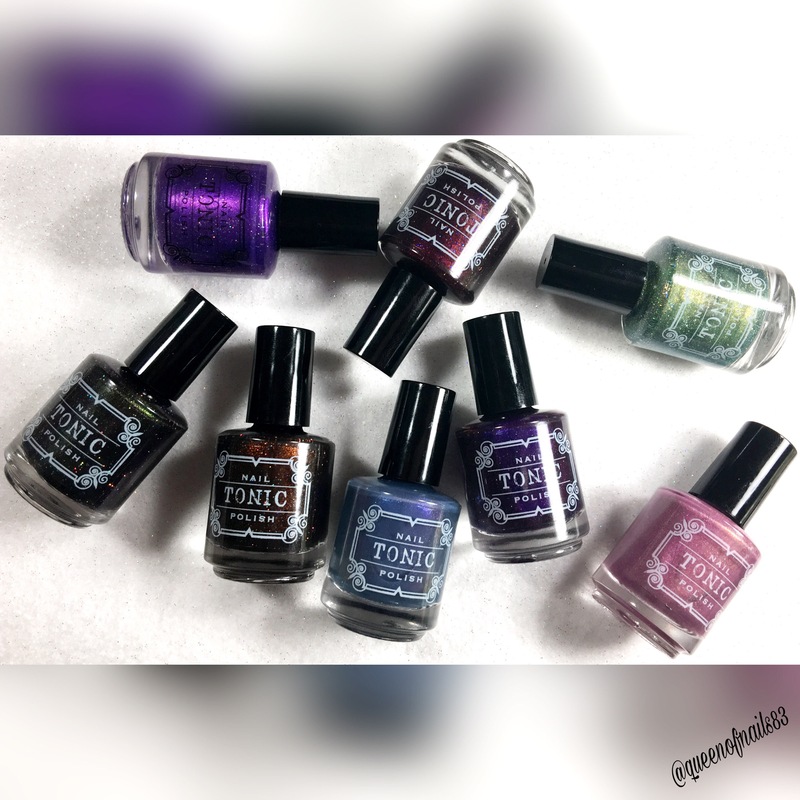 Before I show you the polishes, can I just say…again, how bummed I am that I was unable to make it to Polish Con 2016 in Chicago last month. To be in a room surrounded by fellow addicts and makers would have been heaven on earth. Instead, I was stuck in Maryland scrolling and refreshing and scrolling some more through Facebook in hopes to get a glimpse of a live stream, a picture…a morsels of Polish Con. I would have loved to meet the infamous Lindsey Buck…the women who makes my heart melt and my nails beautiful. However, she must have sensed my despair (kidding) and sent the next best thing, her Halloween Collection AND Polish Con Duo!! The Halloween 2016 Collection includes 8 colors available for pre-order which started yesterday, October 2nd at 2:00pm CST. 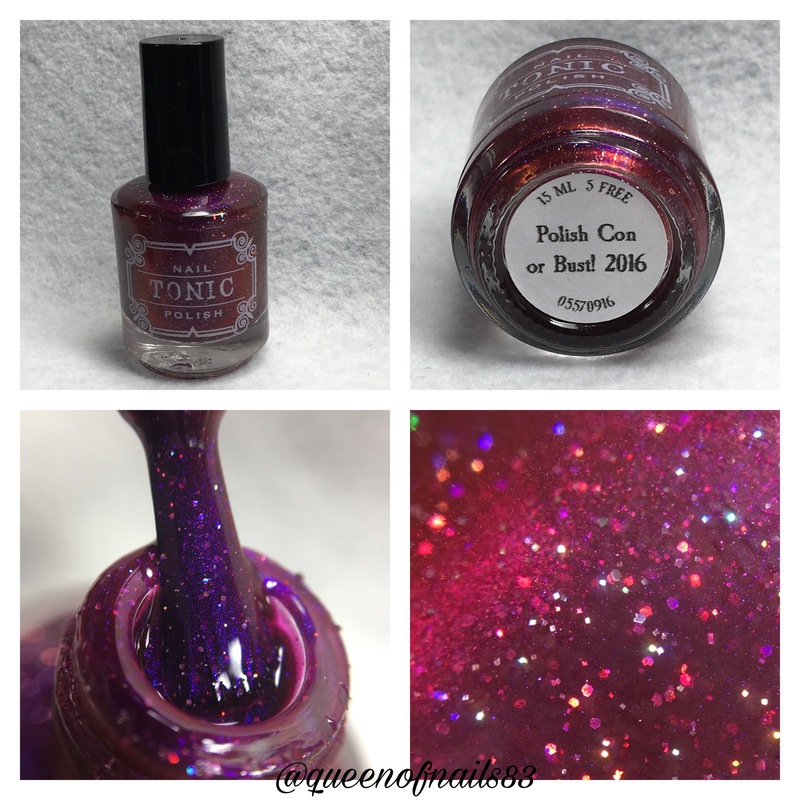 Polish Con Limited Edition Duo (PCLE), “Polish Con or Bust! 2016” and “Windy City” are also available now. The PCLE will be for sale for one month and then retired. There is a possibility they may make another appearance in the future for Polish Con anniversaries but no guarantees!! So now that you have been full warned, let’s check out these beauties! 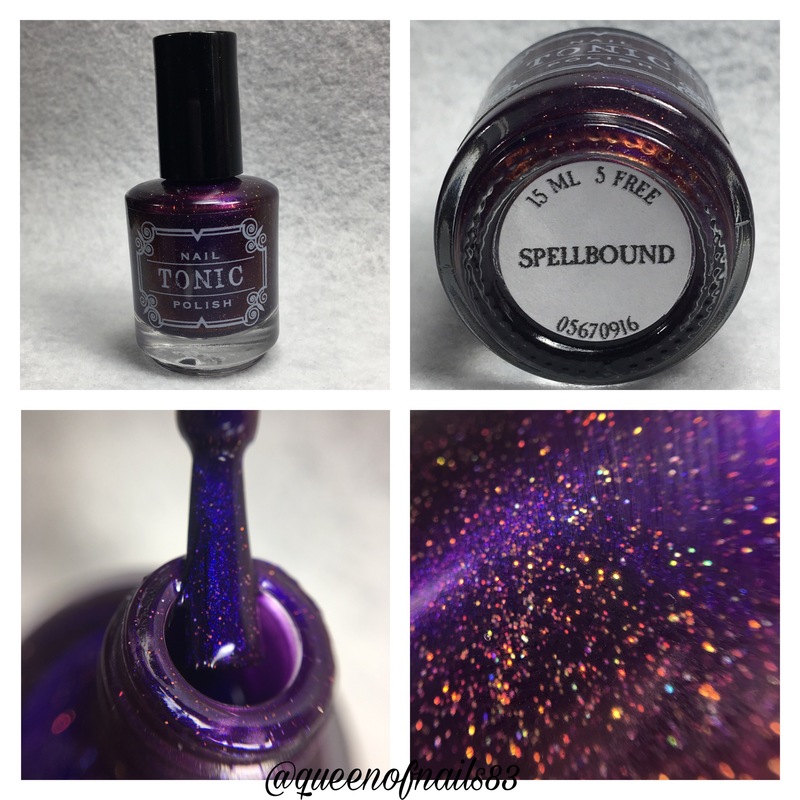 Spellbound – A grape violet jelly base with a dark blue-violet shimmer that shifts to vivid red at an angle and tiny holo micro glitters. 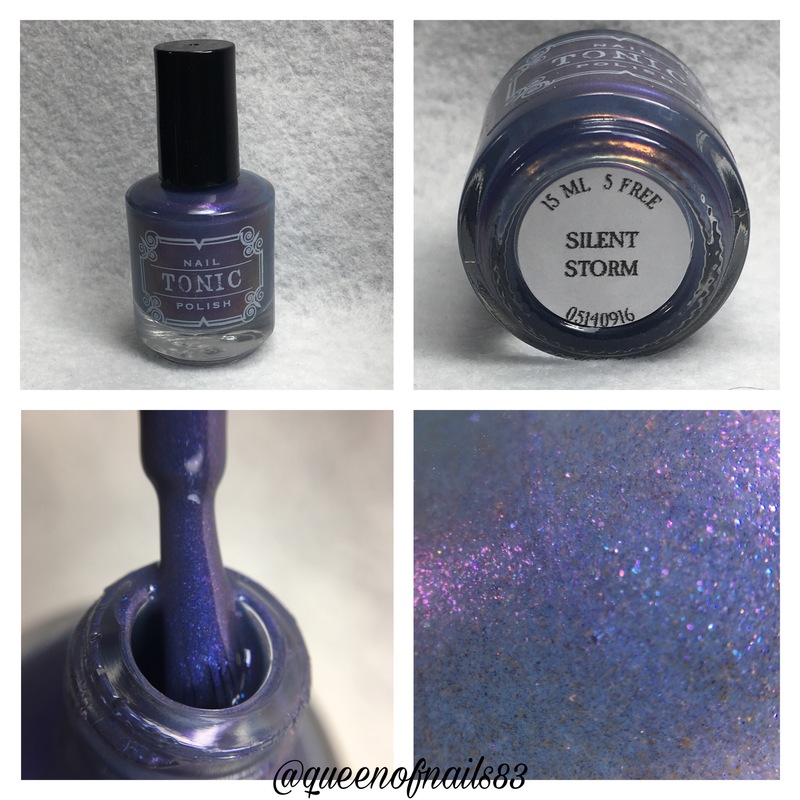 Silent Storm – A stormy grey-blue with glowing blue multichrome shimmer that shifts to purple and red-pink. 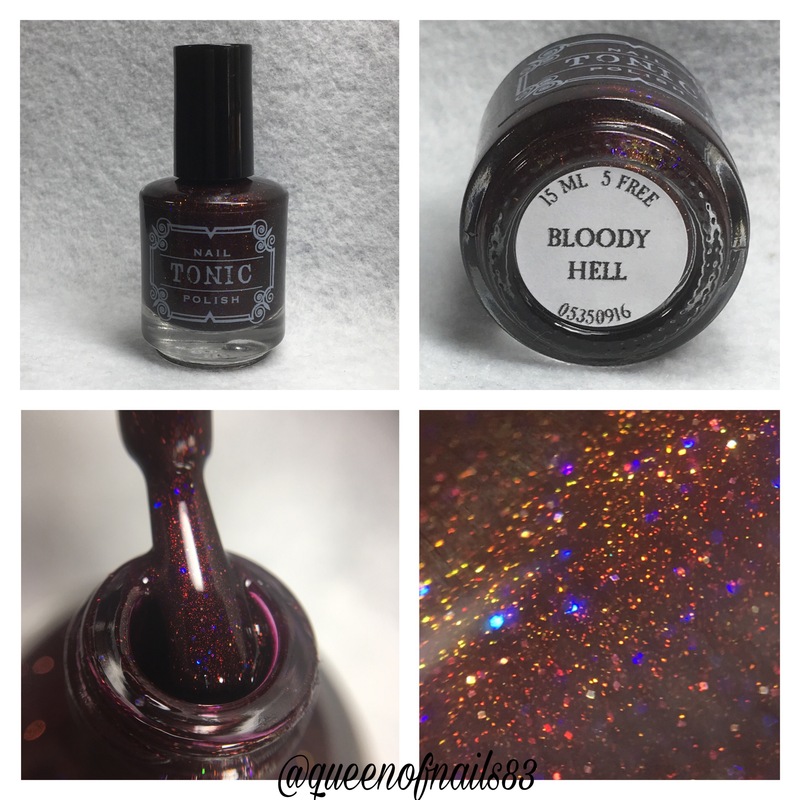 Bloody Hell – Blackened maroon jelly base with sparkly ruby-red shimmer and sprinklings of tiny holo micro glitters, and glowing iridescent blue micro glitters that sparkle out mysteriously in certain lights like eyes glowing out of the darkness. 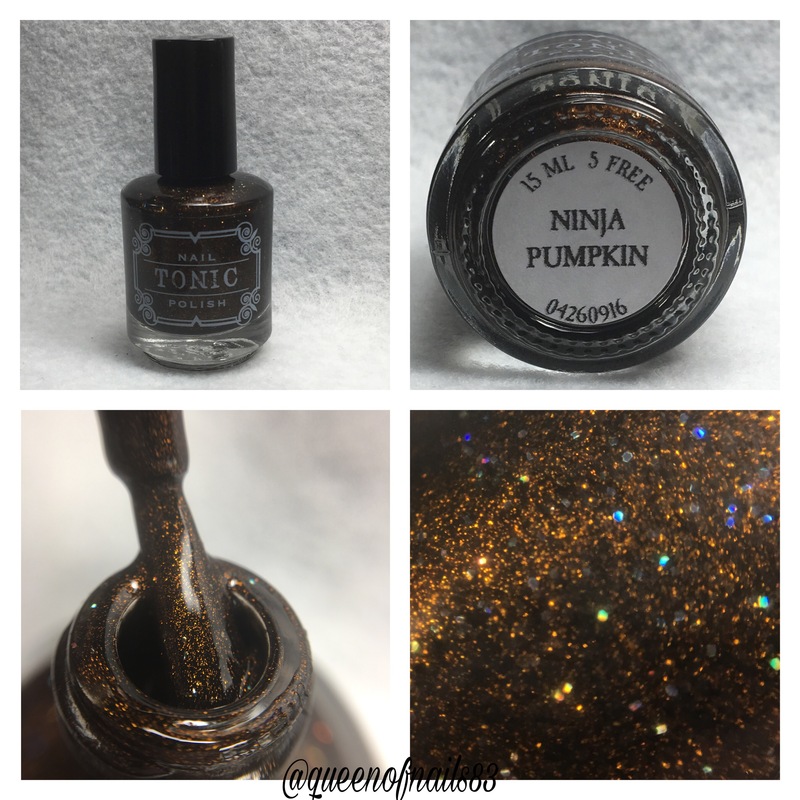 Ninja Pumpkin – Black with metallic orange shimmers and a sprinkle of black holo microliters. Slitherin’ – A metallic multichrome that shifts from acid-chartreuse to green to turquoise with scattered holo and silver holo micro glitters. Watcher’s Woods – a dark plummy-brown with multichrome shimmer that shifts from silver to vivid green to purple and has silver holo micro glitters. The green shift is most dominant and that is often the resting state of this color. Poison Rose – dreary mauve-leaning blush pink with metallic pink shimmers and fine scattered holo. The pink shimmer shifts subtly to golden green at an extreme angle, belying its poisonous nature. 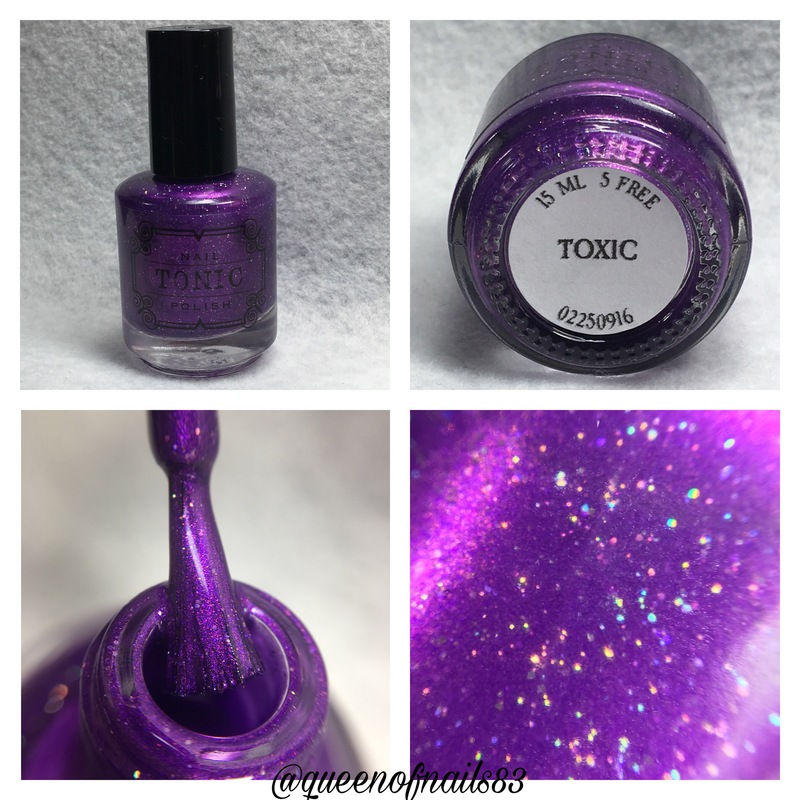 Toxic – Electric purple shimmer with silver holo micro glitters. Polish Con or Bust! 2016 – A raspberry jelly base with glowing royal blue multi chrome shimmer that shifts to vivid orangey-red at an angle and holo micro glitters. Windy City – A medium royal blue base with intense pink shimmer, pink/gold/green shifting flakes, and silver holo micro glitters. WOWZA! 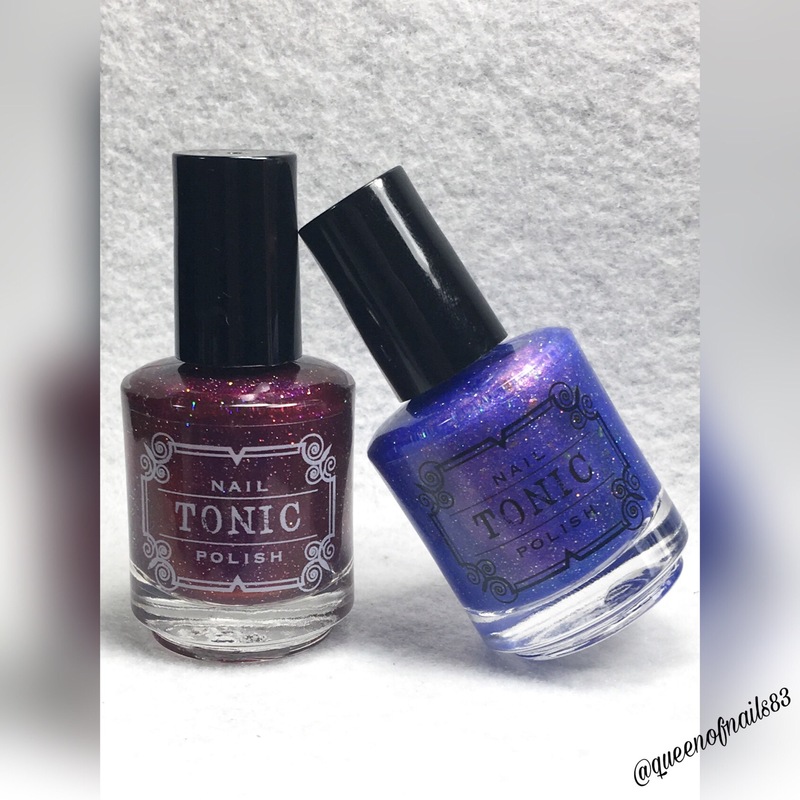 10 new polishes currently available from Tonic Nail Polish! Overall, this collection is gorgeous and the formula and application are exactly what you expect from Tonic. If you are new to Tonic, this is a great first collection to own. All 10 shades are phenomenal, you can definitely tell that Lindsey takes her time to perfect every color and finish. If you too are a fan, then you’ll want to be sure to have these in your collection. All of these polishes are opaque in 2-3 coats depending on preference and style of application (swatches show in 2 coats) and top coat is strongly recommended for maximum shine and color impact. While I love them all, I’m sure I don’t have to tell you which are my favorites. Bloody Hell and Ninja Pumpkin! I got to know which have you already purchased or are you planning to purchase? all are so pretty! I really love Spellbound! Oh yeah! These ARE super pretty. Gahh I need to order some of these!! I bought a few polishes from her at Polish Con and I’ve been loving them! This is a stunning collection, I can’t honestly pick any favourites because they all are! Ohhhhhhhh they make my heart sing! So pretty! 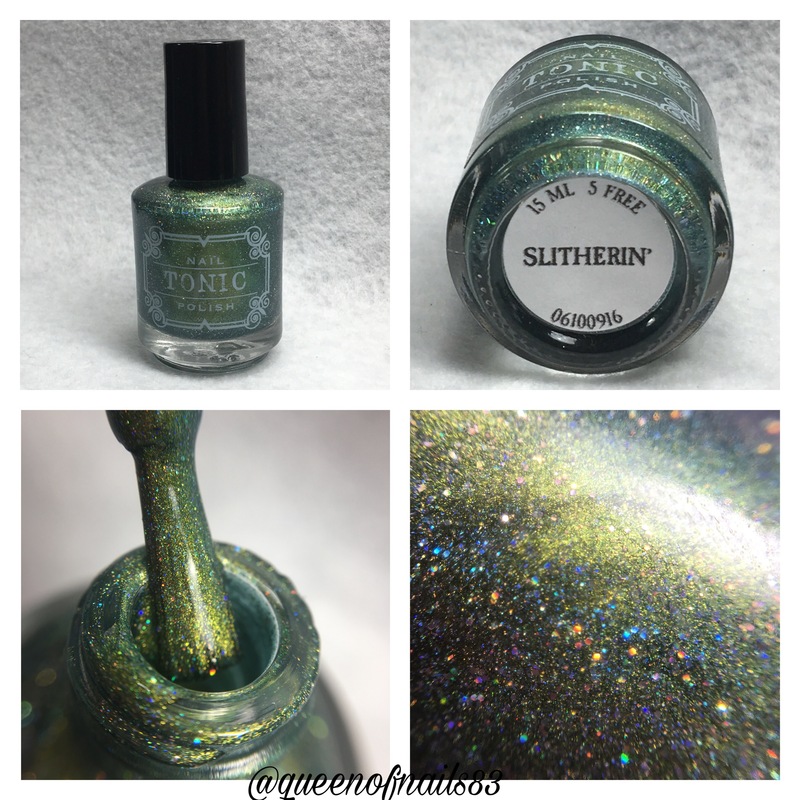 I need to order Slitherin’ and I was surprised by how much I liked Windy City! I just ordered some tonic’s, I can’t wait to get them!